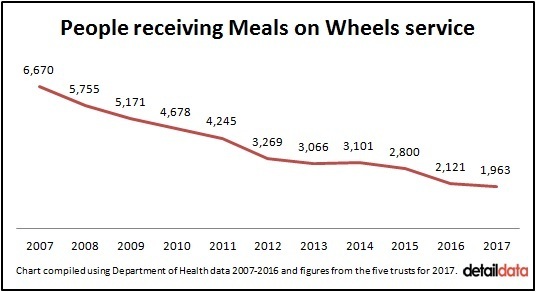 THE number of people receiving Meal on Wheels services in Northern Ireland has dropped by 70% over the last 10 years – while cases of malnutrition among older people have increased. Figures requested from the health trusts by Detail Data show that chilled or hot meals were delivered to only 1,963 people in March 2017 compared to 6,670 receiving meals in their homes in March 2007. The dramatic cut in the community meals service has taken place despite a 25% increase in the number of people aged over 65 living in Northern Ireland over the same time period. There were an estimated 241,928 people in this age category in 2007, rising to 303,280 in 2017. The Northern Ireland Statistics and Research Agency has projected there will be 549,358 over 65s by 2066. There is also a government policy in place which aims to support and promote older people living at home for longer. Linda Robinson, chief executive of charity Age NI, said the decline in the Meals on Wheels service was “alarming” and called for it to be reviewed and redesigned. The Department of Health confirmed that the vast majority of those receiving meals in 2017 were aged over 65 (93%) with half aged 85 or older. The department said that the focus on promoting independent living has led to people opting for alternatives to community meals. There are stark regional discrepancies. Almost half of those receiving Meals on Wheels in March 2017 lived in the Western Health Trust area. The Southern Trust does not provide a Meals on Wheels service. There were 92 admissions to hospital of people aged 65 or older with a diagnosis of malnutrition in 2016/17 – compared to less than 20 admissions in this category 10 years ago. Thousands of older people were put through a process of ‘reablement’ in 2016/17. The process is designed to help them to learn or relearn skills to help them to do things for themselves. In the 2016/17 financial year, Northern Ireland spent almost £9m on NHS prescriptions for oral nutritional supplements. Peter Passmore, Professor of Ageing and Geriatric Medicine at Queen's University Belfast, said that the regional differences “smack of postcode provision” and questioned how the varied approach for older people can be justified. Figures provided by the five health trusts in response to Freedom of Information requests we lodged reveal that 1,963 people were receiving Meals on Wheels as of March 2017. 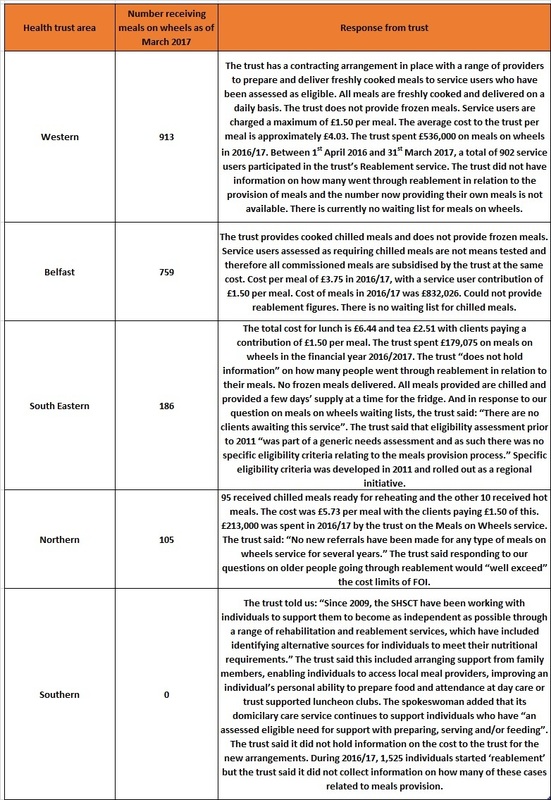 The breakdown per trust is Western (913), Belfast (759), South Eastern (186), Northern (105) and Southern (0). Providing the service in the 2016/17 financial year cost a total of £1.76m with service users paying £1.50 per meal. The cost to the trust per meal ranges from £3.75 to £6.44. The Department of Health said that Meal on Wheels are provided or arranged by trusts "for vulnerable people where an individual needs assessment shows that a person is unable to obtain a nutritious cooked meal and would be at risk of malnutrition if such a meal services was not provided". The eligibility criteria for meals on wheels includes a service user who does not have the physical or cognitive ability to make their own meal but can reheat a meal and having no access to any other source of food including through a family, relative, neighbour or community group. A department spokesperson said: “The Health and Social Care system provides extensive support to older people, with a central focus on promoting independent living. In response to the huge variance between trusts, the department spokesperson said: "Variations in activity levels across and between trusts can often be accounted for by the responses made by trusts to their local circumstances i.e. their understanding of what best meets their local population needs." Click here to read the full response from the department to all of our questions on this issue. Only two trusts provided statistics on the number of older people going through 'reablement' services. Table compiled by Detail Data using information requested from the health trusts. Linda Robinson is chief executive of Age NI, the leading charity for older people in Northern Ireland. The charity runs day centres across Northern Ireland and their services include providing hot meals for those who attend. Many of the centres have a waiting list for places. She said benefits of the Meals on Wheels service include someone checking in on older people as well as the nutritional value of the meal. “Loneliness is a significant factor in the lives of these people,” she said. “I think it is quite alarming that instead of using services that we should be promoting to support older people to live at home, the numbers are actually dropping significantly. “It would seem to me that rather than reducing the meals and in fact doing away with them completely in one trust areas, it is perhaps time to look at it and redesign it so that we do have it as a factor in supporting people to live at home. Age NI is very clear that the burden of care should not be placed on carers. We spoke to 80-year-old Jean Ewing, Robert Atkinson (79) and David McMillen (82) about their weekly meals. They all attend Age NI’s day centre at Skainos in East Belfast where they receive a cooked lunch. Jean said: “Our church has a lunch club on a Monday. On Wednesday I go to Cregagh Methodist, they have a lunch club, so that’s two days taken care of. Usually when I go out I’m still inclined to buy too much but I would make enough to do two dinners. Eat one and freeze the other. And then I come here on a Friday. I’ve got out of the way of cooking. I’m going to have to shake myself and get stuck into the cooking again but I do like a dinner. “My daughter is very good too and she would bring me down soup and meals and things like that and she takes me out on Saturday. Robert Atkinson buys cooked meals from a company in England. The food is delivered once a week and stored in his freezer. Robert attends Skainos Day Centre five days a week – he has two allocated days as a service user and volunteers there the other three. David McMillen eats out four days a week including two days at Skainos Day Centre, one day spent with his son and partner and he eats with a friend on a Thursday at the Welders’ Club. “I’m really only cooking over the weekend but I would cook,” he said. “Not big meals or anything, but sufficient. I wouldn’t buy ready meals. I cook it all myself. I have a good set up at home and I had a wife that taught me how to cook. Malnutrition is a major public health issue and most prevalent in the community setting. The Health and Social Care Board has confirmed that it affects 29% of patients admitted to hospital throughout Northern Ireland. From June 2016 to May 2017, the associated healthcare costs of malnutrition were almost £22m. In the last financial year, almost £9m was spent on NHS prescriptions for oral nutritional supplements. Under Freedom of Information legislation, we requested data from the Hospital Inpatient System from the Department of Health. This shows that there were 92 admissions to hospital of people aged 65 or older with a primary or secondary diagnosis of malnutrition in 2016/17 – compared to less than 20 admissions in this age category 10 years ago. The 2016/17 admissions involved 51 individuals. We asked geriatric expert Professor Passmore to comment on the drop in meals on wheels and the malnutrition figures. He said: “It is disappointing to see how these statistics have evolved and it looks like the drive to ensure self sufficiency is ongoing. I do wonder about the impact on families and carers. “It looks like the Western Trust is adhering to a traditional model of meal provision and historically the personal contact with this service has been seen as a great advantage. “Northern Ireland is a very small place so it is very difficult to reconcile the variances for older people across the province. This smacks of postcode provision. How can there be justification of this varied approach for older people? “Does no one query the inequity here? Why do people in Belfast and people in Fermanagh receive such different services? Professor Passmore said that many older people are “technically malnourished” when they come into hospital – but this may not be coded as their main diagnosis. “Any trend of an increase in formal diagnoses of malnutrition is worrying,” he said. 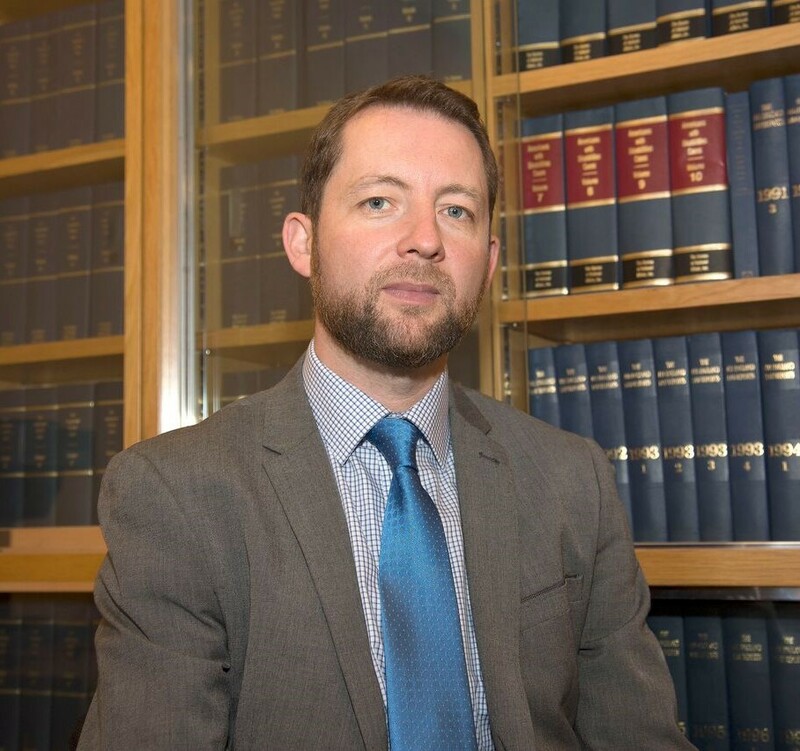 In response to Professor Passmore's comments, the department spokesperson said: "In every case, the responsible trust will provide services based upon an individual assessment of need. This assessment will take into account nutritional needs, in conjunction with input from professionals such as GP, speech and language therapy, occupational therapy and nursing services where appropriate. "Key to this process is outlining actions to support good care based on prevention, identification and management of malnutrition. This is achieved through nutritional screening on admission to hospital. Any person identified to be at risk of malnutrition will then have a nutritional care plan developed appropriate to their needs." The Commissioner for Older People for Northern Ireland, Eddie Lynch, said: “I am concerned to hear that malnutrition admissions of over 65s in Northern Ireland have increased over the last number of years. It is so important that older people receive a balanced and healthy diet if they are to stay as fit and well as possible. “Whilst our older population is growing, the number of Meals on Wheels provided by health and social care trusts is declining. "In some cases, the reduction in the provision of Meals on Wheels is because older people are receiving help to learn or relearn skills and ways of doing things for themselves. "For some older people this can be a positive experience as it can lead to increased independence. However it should only be an option for older people who have the capacity and capability to do certain tasks for themselves. It must be in the best interests of the older person and not simply used as a cost cutting exercise for the trusts. “In addition, the reduction in the provision of Meals on Wheels is partly due to the increasing number of convenience food options and prepared meals that older people can avail of. "However, Meals on Wheels is not solely about food – often it can contribute to general wellbeing, offering interaction with the person delivering their meal. This is crucial for reducing loneliness as many will be confined to the house and for some older people, this may be the only human contact that they have.